I've seen this game on at least two blogs this week, and since I've spent most of this sunny Saturday doing the dreaded grocery shopping and working (oh, what a life I lead), I decided to take a break and try it out. 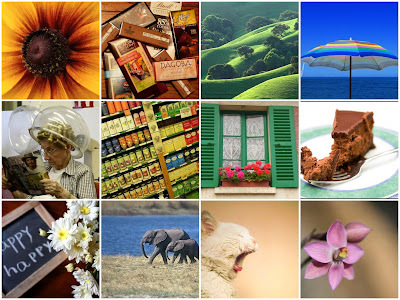 You enter your answers to a bunch of questions into Flickr's search engine and then make a mosaic out of them. You can find the questions and instructions here. Now, given the answer to "one word to describe you," I'm going to bed. hee hee, Mr. Depp is a hottie isn't he? That looks like a fun activity! How did I miss this post? Way cool.